Many dogs are referred to as pit bulls, solely based on their appearance. Not all of these dogs are purebred and eligible to be registered. Only purebred dogs, known as American pit bull terriers are eligible for registration with the United Kennel Club, although other registries may register dogs as pit bulls based on their appearance. 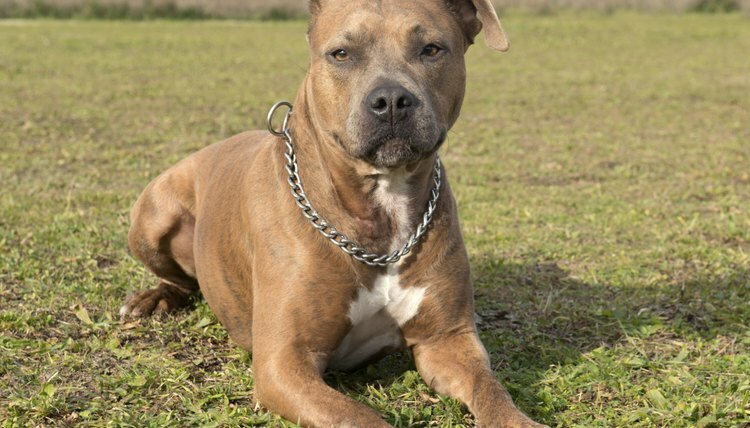 The American Kennel Club does not recognize the American pit bull terrier for registration. They do, however, recognize the American Staffordshire terrier, which is a closely related breed. Litter registration papers are required to register any American Staffordshire terrier with the AKC. These papers attest to the pure breeding of the parents and their respective AKC registrations. The Purebred Alternative Listing provides a dog with a listing number to compete in performance, companion and junior showmanship events. The dog must be spayed or neutered and must be over 6 months of age. Two photographs of the dog must accompany the application. The United Kennel Club recognizes the American pit bull terrier as a pure breed. An American pit bull terrier can only be registered with the United Kennel Club if it is litter registered or if it is already registered as an American Staffordshire terrier with the AKC or the Canadian Kennel Club. A dog also may be registered as an American pit bull terrier with the American Dog Breeder’s Association or as an American Staffordshire terrier with any FCI-affiliated registry. The FCI is a European organization that oversees dog standards and registrations. The dog must be over a year old to be single registered and have several pictures that clearly show his markings and conformation. As with the AKC, UKC will register spayed or neutered American pit bull terriers without papers using the Performance Listing, formerly known as the Limited Privilege Registration. With this listing, the dog cannot compete in conformation shows, but can take part in performance and junior showmanship events. Like the UKC, the Continental Kennel Club will register American pit bull terriers with litter registration papers and will single register adults. Unlike the UKC, the Continental Kennel Club only withholds the pedigree, not the breeding and conformation showing privileges of dogs with no registration papers from other organizations. Such registration only requires that the dog be over 6 months old, that three photographs accompany the registration application. Two “witness” signatures must be on the application, attesting to the truthfulness of the information on the application. The American Pit Bull Registry permits registration of any dog that resembles an American pit bull terrier, as long as the owner provides his or her demographic information, the description of the dog being registered, the names of the dog’s parents and pictures of the dog -- as well as the registration fee. It is not necessary to know the dog’s pedigree; however, the owner must attest to the purebred nature of the dog. The American Dog Breeders Association will only register spayed or neutered dogs of unknown ancestry. They will single register dogs, but they must first be registered with another registry and provide a three-generation pedigree. United Kennel Club: The UKC Limited Privilege Program is Changing! How Do I View My Dog's Parents on CKC?